Dana Edwards grew up in the Valley of the Sun living in Mesa and Phoenix. He is the owner of Cheyava Consulting which specializes in software development, technical consulting and project management. 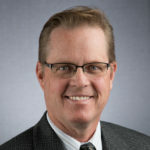 He has over 20 years experience in Engineering Management working for Honeywell, Arizona Public Service, Wells Fargo, Zounds Hearing and Exponent. Dana has a BSE in Computer Systems Engineering and an MBA degree from Arizona State University. The Grand Canyon Council of the Boy Scouts of America recognized Dana with the Silver Beaver award for distinguished service. He currently serves as a Unit Commissioner and Stake Young Men’s President. Dana enjoys mentoring, hiking, cycling and building fun computer controlled creations.